The holidays are coming up. That means a lot of parties. 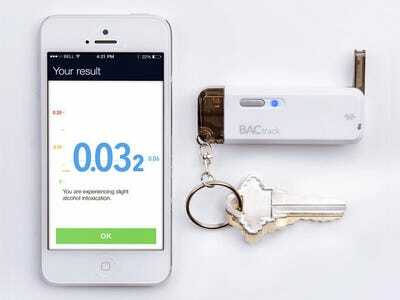 When you’re out and you’ve had a couple of drinks, use this breathalyzer to make sure you’re OK to drive — you need a reliable way to make better decisions. The BACtrack Vio is a quick and easy way to monitor your blood alcohol content at any time, and we’ve got it for 14% off. Even if you’re not driving, use this to think twice about that next beer at the company party. No one wants to be the subject of the watercooler talk the next morning. It’s compatible with your iOS or Android smartphone, and is easy to conceal on your keys. The BACtrack Vio has a sanitary flip-up mouthpiece to keep out germs and impurities. You’ll be happy you checked it. Get 14% off The BACtrack Vio ($US42.99).